Home » General » Independence Day? Posted on Jul 1, 2017 in General | Comments Off on Independence Day? The Land of the Free. As we approach another Independence Day I thought about freedom in this country. 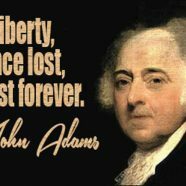 Can you even imagine the amount of liberty that existed in the days following the formation of our nation? I encourage you to take a minute during this holiday and look at just a few of the things that our Founders took for granted but that the government now controls through laws and regulations. This list is far from complete and it only gets longer. The tendency of government is to slowly shrink the box of individual liberty and personal responsibility and count on the citizens to accept this creeping totalitarianism. And accept it we have. While there has been the occasional whimper, month by month we dutifully agree to abide by the mandates of the state, many of which serve no purpose other than to enrich the government. You can’t sell a shower head that uses more than 2.5 gallons per minute or sell, buy or install a toilet that uses more than 1.6 gallons per flush. You can’t live in a home you build with your own two hands or educate your children any way you want. You can’t refuse to sell products to customers you don’t like or refuse to perform a service for someone if you disagree with their lifestyle. You can’t agree to do work for someone in exchange for them doing work for you. You can’t buy or sell raw milk, open a grocery store or carry a gun. You can’t deposit more than $10,000 or even make periodic deposits (or withdrawals) of your OWN money of UNDER $10,000 (Structuring) or transfer money more than 6 times from your savings account. But you also can’t leave a bank account alone for 5 years without the State taking the money. And you can’t leave the country with more than $10,000 in cash. If you are talented enough to make $10 million, and you pay taxes on every dollar you make and put the remainder in a savings account, you can’t leave it all to your kids when you die. You can’t buy a piece of land and build whatever you want on that land. You can’t even own property free and clear. If you have a piece of land completely paid for but stop paying property taxes the state will take your property and sell it. How is that possible? It is almost like the state owns the title and once you stop making your ‘payments’ they repossess the property. You can’t hire an illegal alien, which makes sense, but you can’t check immigration status before you hire someone, which doesn’t. I am going to stop now. I need to get out and celebrate what liberty I have left before it is all gone. Here is something you CAN do. As with anything published on this site, feel free to use all or part of the contents of this article, with or without credit. Anything published on this site is, hopefully, spreading ideas of liberty and freedom and as such is intended for the benefit of anyone who will listen.